Winter in the water …. 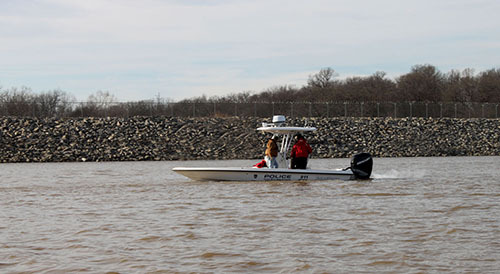 A GRDA Police boat makes its way across the waters of Lake Hudson on a cold January day. If you plan on doing any wintertime boating, GRDA is sharing some important cold weather boating tips you should keep in mind. The temperatures have been going up and down so far in 2019, but that is pretty typical for January in Oklahoma. However, even on the cold days many folks still consider this time of the year to be perfect for a visit to GRDA lakes. In fact, boating, fishing and hunting take place all around the lakes, all around the year. First of all, cell phones: There is less traffic on the water this time of year, which means fewer boaters around to assist you if you get into trouble. Therefore, having a working a cell phone is vital for emergency or non-emergency help. A whistle – attached to your life jacket – is also an important for winter-time boaters. If you can produce a loud and effective call for help with a whistle, you will use less energy than shouting for help and waving your arms. If you do have trouble and go into the water, remember that cold water can rob your body of its heat 25 times faster than cold air and that means the time of exposure needed to experience hypothermia is drastically reduced. Thus, if your boat does capsize, your main priority is to get as much of your body out of the water as possible. If possible, climb on the overturned vessel or nearby debris, or get to the nearest shore or dock. Also, in cold winter temperatures, wet clothing is actually colder than less clothing and can lead to hypothermia more quickly. Remove as much of the wet clothing as possible, as soon as possible. You will be warmer with less clothing than with wet clothing. Of course, whether you are boating in January or July, it is also important to file a “float plan” any time you visit the water. Let someone know where you intend to be boating, who is going with you and when you expect to return. Finally, and always, wear a life jacket. Your friends at GRDA hope you keep these tips in mind when you head to the lake this winter. On a mutual aid mission …. GRDA employees work to clear brush and restore power near Tallahassee, Florida in October, following the devastation left behind by Hurricane Michael. As in previous years, GRDA crews responded to neighboring states in 2018 to provide mutual aid. GRDA “looks back” on this moment, and others in our review of 2018. October: Down along the coast, October usually means hurricane season and, unfortunately, that trend continued in 2018. However, so did the Team GRDA trend of providing mutual aid. 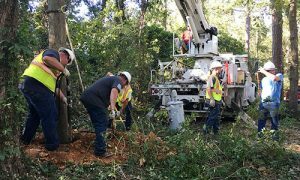 On October 9, a group of 31 GRDA employees headed out for Tallahassee, Florida to assist with repairs to that city’s electric system, following Hurricane Michael. November: In mid-November, GRDA’s “champion chili cooks” from each facility came together for the grand finale chili cook-off, held in conjunction with the November GRDA Board of Directors meeting. 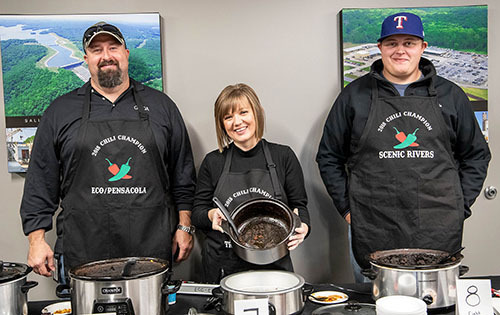 Transmission’s Laurel Swift took the top prize but, more importantly, the cook-off served as a fundraiser for GRDA’s Oklahoma State Employee Charitable Campaign and raised nearly $1,300 for charities in the month of November. Altogether in 2018, GRDA employees raised nearly $18,000 for charity. December: As we entered the last month of 2018, GRDA was receiving recognition as a finalist for the 2018 Power Award of Excellence at the 2018 S&P Platts Global Energy Awards in New York City. Though the Authority did not win the top prize, it was selected as a global finalist for its recent contributions and investment in power generation, as well as other factors. For GRDA, it was a great way to conclude the year and a strong platform to build on in 2019. Team GRDA wishes you and yours a safe and prosperous New Year! 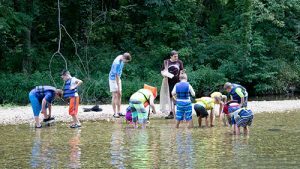 Reading, writing and rivers … Students participate in the Journey to the Bottom of the Creek workshop along the Illinois River in July 2018. GRDA was proud to work with other organizations to help make this event possible. It is one of the highlights as we look back on GRDA’s summer of 2018. July: With summer’s arrival in Northeast Oklahoma, students moved from the classrooms to the river bank and lake shore. GRDA was proud to team with the Oklahoma Conservation Commission and the Oklahoma State University Extension Office to host both the Journey to the Bottom of the Creek and A Grand Adventure workshops for students. 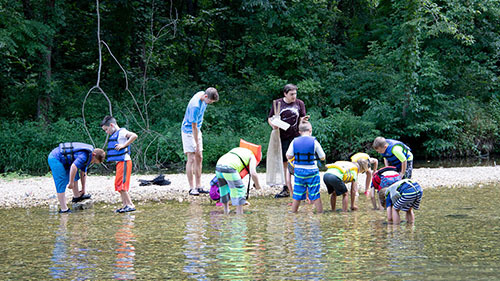 The day-long camps focused on water quality and conservation, aquifers, as well as other creek-side and lake-side experiences. Plans are already in the works for 2019 events. August: In August, GRDA said goodbye to longtime board member and Grand Laker Ed Townsend, who completed his term on the board. Also that month, Joe Vandeiver (Owasso) ended his yearlong term as board chairman before handing the gavel over to Tom Kimball (Owasso) who is serving as the current GRDA Chairman. Also that month, Jim Richie (Jay) was chosen by his fellow board members to serve as chair-elect in 2018-19. Down on the Illinois River, the GRDA Float Crew, which cleans up trash and recyclable materials along the river bank, reported that it had collected 103 pounds of aluminum during its mid-summer campaign. Like the Grand Lake Adopt The Shoreline program, which kicked off earlier in the year, this cleanup effort promotes safety, scenic views and helps GRDA fulfill its stewardship mission. September: In September, the education opportunities continued as GRDA helped to host lake management personnel from all across the country during a Federal Energy Regulatory Commission (FERC) workshop. Among other activities, the group learned to build artificial (Rush For Brush) fish habitats at Wolf Creek Park, in Grove. They also had the chance to learn about other GRDA lake management practices. Next week, our review continues with a look back at the last three months of 2018. Tour time for Tech Team … In June, GRDA’s Grand River Energy Center (GREC) played host to administrators from the Oklahoma Career Tech system. This week, we look back on that event and others from April, May and June. 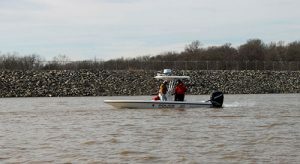 April: The Grand Lake “Adopt the Shoreline” program, resulting from a cooperative agreement between GRDA, Grand Lake Sail & Power Squadron and various Grand Lake stakeholders, kicked off during the month. The ongoing effort utilizes volunteers from around the lake, working in adopted “zones” to help keep the shoreline clean, safe and scenic. We’re looking forward to more program successes in 2019. 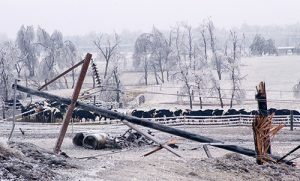 Also in April, GRDA lent a hand to its Western Oklahoma neighbors by transporting hay to farmers and ranchers impacted by drought and wildfires in that area. The hay was donated by residents near Vinita, loaded onto GRDA semis and delivered to those in need in the Vici, Oklahoma area. May: For GRDA, the month of May got off to a great start when it received an “Outstanding Stewards of America’s Waters” award on May 1, at the National Hydropower Association Conference in Washington, D.C. The award recognized GRDA’s ongoing “Rush For Brush” program and it successes. Also in May, GRDA continued its support for education by once again participating in Mayes County’s “Third Graders Go To Work” program at the Ecosystems Center in Langley. June: In June, GRDA had the opportunity to tell it story to both area civic leaders and educators. Early in the month, GRDA President/CEO Dan Sullivan was the keynote speaker during the Rotary Club of Tulsa’s June meeting. 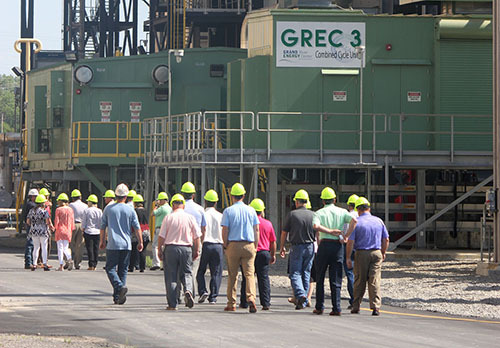 That same week, GRDA’s Grand River Energy Center (GREC) played host to 40 Oklahoma Career Tech administrators who had the chance to see the inner workings of the new GRDA Unit 3, as part of a larger tour of Oklahoma industry. Next week, the year-in-review continues with a look back at the busy summer months. January: After much of 2017 was marked by the construction of its new Unit 3 combined cycle gas plant and repairs to its Unit 2 coal generator (damaged in 2016), the Grand River Energy Center (GREC) entered 2018 on a strong note. In fact, on the first day of the year GREC combined to reach an output of 978 megawatts from the new and newly-refurbished units. 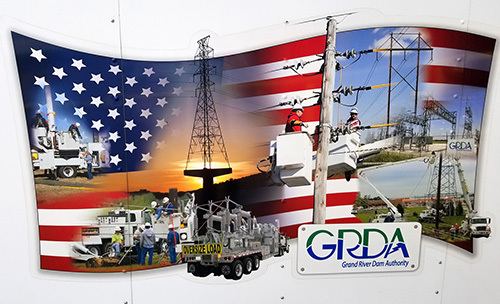 Also in January, GRDA welcomed home some of its transmission personnel who spent much of December in the U.S. Virgin Islands, helping that territory rebuild its electric infrastructure after hurricane damage. This was another example of GRDA responding to mutual aid requests for assistance from other public power utilities. 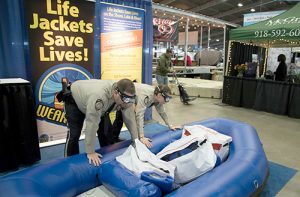 Life-saving simulator… GRDA Police Officers Eric Gwartney and Lissa Kennedy take part in the timed life-jacket simulator inside the GRDA Police Department’s booth at the Tulsa Boat Show in February 2018. In this weeks’ column, we also look back at some other highlights from GRDA’s 2018. February: At the Tulsa Boat Show, GRDA Police continued to stress the importance of life jackets with its “lifejacket challenge” simulator to help participants understand just how little time they have to put a jacket on following a boat accident. The simulator sent an important message: Wear it! Also in February, GRDA met with all of its customer classes in annual meetings that help to maintain beneficial partnerships and keep the lines of communication open. March: GRDA was the proud recipient of two “Regents Business Partnership Excellence” Awards for its work with Northeastern State University (Tahlequah) on a new water lab as well as its partnership with NEO A&M College (Miami) for utilization of GRDA property in Ottawa County for outdoor classrooms. Both awards highlighted GRDA’s continued support of education across the state, as well as its commitment to be a good steward of the natural resources under its control. Next week, we will continue our look back on GRDA’s 2018 with a review of April, May and June. Approximately 40 Grand River Dam Authority employees, representing a variety of departments, gathered at the Transmission Maintenance Headquarters last week to discuss one important topic: storm response. A scene we don’t want to see … It’s been a few years since ice did this kind of damage to its system but still, GRDA continues to refine and revisit its storm response plan for such times. At the same time, we want you to be safe as well, so we are passing along some tips to keep in mind if you ever encounter downed power lines. While ice storms are not something any utility wants to face, this time of year is always a good time to revisit the response plan GRDA has in place for such natural disasters. Of course, that plan is also in place for other types of weather that could damage the system, such as tornados and wildfires. No matter the cause, GRDA wants to be as prepared as possible to respond, rebuild and restore reliable electricity. To do that, Team GRDA’s experienced and dedicated team of professionals come together regularly to discuss and refine the storm response plan so that when the storms do come and the lines do fall, our crews can work safely and swiftly to get the lights back on for our customers across Oklahoma. Of course, GRDA wants you to stay safe during such episodes too and the most important part of any outage storm response plan is understanding the dangers of downed power lines. What follows are a few safety tips from the Electrical Safety Foundation International (esfi.org) and other sources. We pass them along in hopes you will stay safe this winter, no matter what weather may come your way. ALWAYS assume fallen power lines are energized. Stay at least 35 feet away from a downed power line and any nearby objects it may be touching, such as a fence or tree limb. Remember, a power line does not need to be sparking or arcing to be energized, even if it’s sagging close to or on the ground. Around the Grand River Dam Authority, chilly weather outdoors equates to chili cook-offs indoors. Of course, it’s all for a good cause. CHILI CHAMPS … Laurel Swift (center) won the Grand River Dam Authority Chili Cook-off. Matt Conrad (left) and Robert Lee tied for second place. More importantly though, the Authority-wide completion raised $1,300 for local charities through the GRDA State Charitable Campaign program. In October, the GRDA State Charitable Campaign Committee (SCC) coordinated chili cook-off events across several facilities. Participants brought in a pot of their special recipe chili and coworkers donated to the cause for the opportunity to serve as judges. Individual winners from these initial facility cook-offs then brought their award-winning recipes to a luncheon following the November 14 meeting of the GRDA Board of Directors. With board members serving as judges, GRDA’s Laurel Swift took the top chili honors for 2018. Of course, the real purpose behind the competitions was charitable fundraising. Altogether, GRDA employees were able to raise approximately $1,300 through the friendly competition. Those funds will be donated to several different organizations, including the Mayes County Angel Tree, Cherokee County Humane Society, Neighbors Helping Neighbors, Eastern Oklahoma Food Bank and Youth Services of Tulsa. With over 500 employees spread across several facilities, “coming together” can sometimes be a challenge. However, during the holiday season, events like the cook-offs, and others coordinated by the GRDA SCC, are good reminders that we are all on the same team. As cooler temperatures arrive and we all seek ways to stay warm, the Grand River Dam Authority wants to pass along some safety tips that can be helpful if you are using a space heater. It’s the season for falling leaves, shorter days and cooler temperatures. For many of us that also means we will be spending more and more time indoors in the weeks and months ahead. As we move into this time of year and seek warmth in our comfy, cozy houses, we need to make sure that safety is always a priority. If some of your home’s warmth comes courtesy of an electric space heater, the Grand River Dam Authority wants to pass along the following safety tips to you. They come courtesy of the Electric Safety Foundation International (esfi.org). First of all, make sure your space heater has the label showing that it is listed by a recognized testing laboratory. And, before using any space heater, read the manufacturer’s instructions and warning labels carefully. Inspect the heater. Does it have cracked or broken plugs, or any loose connections? If so, do not use it. Remember, space heaters are only meant to provide supplemental heat and should never be used to warm bedding, cook food, dry clothing or thaw pipes. Proper placement of space heaters is critical. 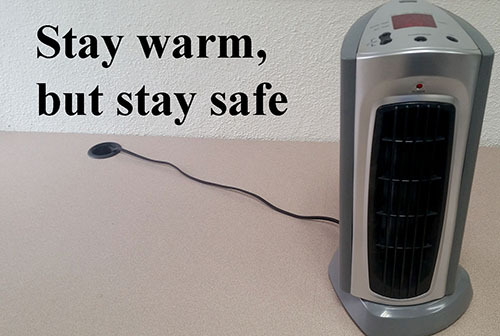 Heaters must be kept at least three feet away from anything that can burn, including papers, clothing and rugs. 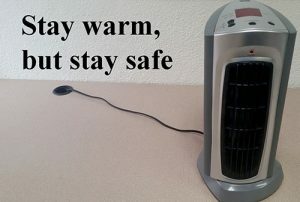 Also, locate space heaters out of high traffic areas and doorways where they may pose a tripping hazard. Place them on level, flat surfaces. Never place heaters on cabinets, tables, furniture, or carpet, which can overheat and start a fire. These are just a few of the tips you should keep in mind. For more electric safety information, visit esfi.org. Stay warm, but stay safe! Ready to respond … Clint Bogle, a member of the Grand River Dam Authority’s Substation Maintenance Department, surveys the scene inside one of the Authority’s substations. 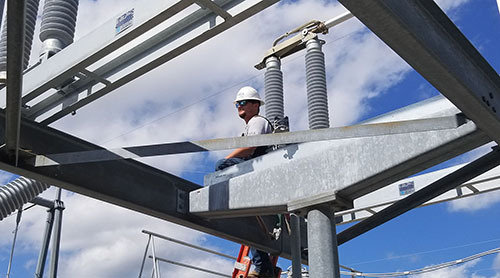 From power plants to electric lines, and from substations to system operations, GRDA personnel make electric reliability a priority each day. And, when storms or accidents cause an interruption in power flows, they make quick and safe power restoration the top priority. Sometimes it happens because of the weather, sometimes it happens because of an animal, sometimes it happens because of an accident and sometimes it may happen because of an equipment failure or for other reasons. The point is, electrical outages can occur for a number of reasons. That is why it is so important for utilities like the Grand River Dam Authority to have experienced personnel who are prepared to respond promptly and safely to get the lights back on. At GRDA, these employees can be found in many departments and facilities. From the system operations personnel who are typically the first to see power disruptions on the system to the field personnel who respond to the trouble at all hours, under all sorts of weather conditions, it truly does take the effort of a skilled, dedicated team to get the power flowing again safely and promptly. Of course, the best preparation for power outages happen long before any unplanned outages ever do. Through ongoing employee training, a commitment to a culture of safety, preventive maintenance and other initiatives, Team GRDA is working every day to not only produce the power but to make sure it flows reliably across the system. And when it doesn’t? The team is ready to respond to make the necessary repairs. They know how to reroute the power around troubled areas, they know the best approach to repairing the damage and, most of all, they know GRDA customers and thousands of Oklahomans are counting on them to do just that. No one likes a power outage, but when it does happen, Team GRDA is always ready to respond.